Tickets are sold out! Keep your eyes on our website for articles detailing prizes, our streaming schedule, and more as we get closer to the event! Fantasy Flight’s World Championships is the grand finale to each year’s Organized Play programs and a celebration of the diverse and global community surrounding each of our seven supported games. 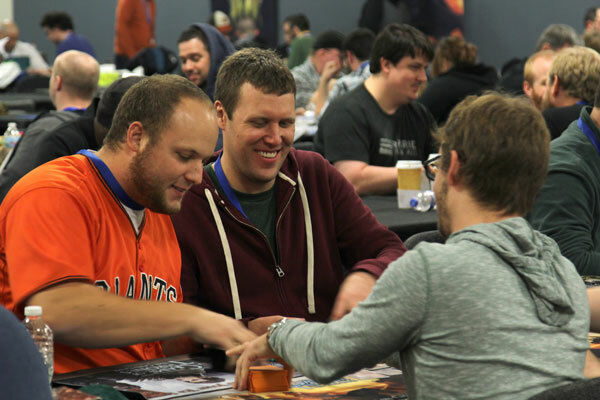 Held at Fantasy Flight’s very own Games Center in Roseville, Minnesota, hundreds of players from around the world compete for the title of World Champion and join in a one-of-a-kind experience. Each year, our World Championships grows by leaps and bounds, and the 2016 World Championships continued that trend by selling out within hours—and in some cases, minutes—of tickets going on sale. If you were unable to obtain a ticket, you can follow along on our Twitch channel during the event, and we hope to see you next year! The World Championships is the biggest event of the year and the pinnacle of the Organized Play calendar. The largest FFG event of the year encompasses a World Championship tournament for each of Organized Play’s seven games, as well as numerous side events, awesome prizes, the highest level of competition, a great gaming space, on-site food and drinks, streaming coverage, and a whole lot more! 2016 will see another exciting highlight added to that list: Our auxiliary space will be held in the Radisson Hotel, next door to the event and a popular place for attendees to stay during World Championships. Each year, players come to Minnesota from around the globe, having fought through tough competition in their hometowns, regions, and countries. They face off against the best players around the world in tense matches each day before spending the evenings sharing a drink with their opponents and reminiscing over difficult decisions made earlier in the day. This blend of competition and camaraderie is what makes the World Championships so unique and an event players plan for as soon as the last one finishes. The FFG World Championships are more than competition, however. They’re the peak of Organized Play and all for which it stands – the chance to enjoy your favorite games within an extended community of enthusiastic gamers, including players and National Champions from around the globe. Altogether, the FFG World Championships are an amazing, five-day, international celebration of FFG’s Organized Play games and the players that make them great! Tickets are sold out! We hope to see you next year when we will host a World Championship for both of our new game tracks! FFG World Championships are held in the Fantasy Flight Games Center, located minutes from downtown Minneapolis and right off the main route of I-35W. International players should plan on flying into Minneapolis - St. Paul International Airport (MSP). From the airport, attendees can take public transportation or a 40-minute taxi ride. There are a number of hotels within walking distance of 2016 World Championships, including a few newly built this year. If you are booking a room at the Radisson Hotel, make sure to mention FFG's 2016 World Championships to get a discounted rate! For more information on other accomodations and attractions in the Roseville area, please visit the Roseville Visitors Association.